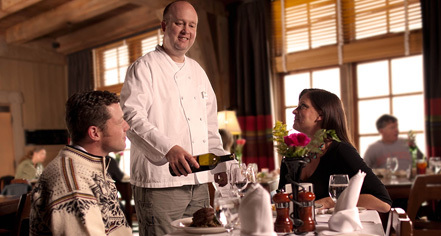 Affording an elevated culinary experience, Timberline Lodge offers a variety of casual and formal dining establishments led by Executive Chef Jason Stoller Smith. Passionate about gastronomy, Chef Stoller oversees the various food outlets of the lodge, including catering for events, meetings, and weddings. With a reputation for utilizing locally grown sustainable produce and ingredients from Oregon farmers, ranchers, vintners, and fishermen, Chef Stoller supports the farm-to-table movement, creating a true seasonal and delicious menu. The Cascade Dining Room is celebrated for its wine list and refined dishes, prepared with the freshest seasonal local ingredients. Boasting magnificent views of the commanding mountain peaks, the Cascade Dining Room serves Northwest Alpine cuisine daily for breakfast , a popular lunch buffet, and formal dinner . Reservations are required for dinner. Situated on the second floor circular balcony, Ram's Head Bar is a casual family-friendly establishment doling out hearty food and drink with a brilliant backdrop of Timberline Lodge's surroundings. 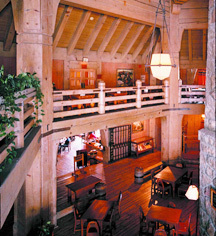 Rich in heritage and tradition, Blue Ox Bar is a treasured watering hole tucked behind the main lobby inviting a distinguished warmth and escape after a long day on the mountain. Featuring brilliant glass murals of Paul Bunyon and the restaurant's namesake, Babe, this beloved historic restaurant offers pub-style pizza and handcrafted microbrews from the Mt. Hood Brewing Company. At the Wy'East Day Lodge, The Black Iron Grill and Y'Bar provides skiers and riders a delicious menu while taking a break from the slopes to refuel.